1. Application - Logs information from applications like MS Office, SQL Server, Visual Studio etc. 3. System - Logs information related to driver, system service failures etc. 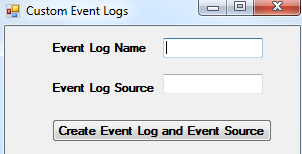 Let us now create a windows application that can be used to create a custom windows event log and event source. The Event Source is the name of the application that logged the event. The event source is displayed in the details pane, when an event is selected in the event viewer. Steps to create the windows application to create the custom windows event log and event source. 2. Arrange the controls, so the form looks as shown below. 6. Enter the name and source for the event log. Open the event viewer. The newly created "event log" should be under Applications and Service Logs. If you are not able to locate them, restart your machine. Additional information: The source was not found, but some or all event logs could not be searched. To create the source, you need permission to read all event logs to make sure that the new source name is unique. Inaccessible logs: Security. Try running the windows application as an administrator and see if that helps. Good Luck. Dear sir, when i executed the code . i am getting a exception. can u help me. To create the source, you need permission to read all event logs to make sure that the new source name is unique. additional Information: The source was not found,but some or all event logs could not be searched.